Camshafts: Replace or Not to Replace? So, you have 1,000,000 plus miles on your engine and you’ve decided it’s time for a rebuild. Some parts you know you have to replace but others you aren’t so sure about. Fuel injectors, oil coolers, oil pumps, and oh, what about the harmonic damper? Our staff gets questions on these parts all the time, but one item that doesn’t get nearly as much attention is the camshaft, and it should. A high mileage camshaft needs to receive just as much care as any other “standard” replaceable part during the rebuild process, but it is often overlooked. Most people assume that if the camshaft isn’t flaking, pitted or ground right down, it can be put back into use without any further inspection or maintenance. However, in many instances a camshaft can be worn well past its reuse limit without any obvious visual signs of wear and tear. The old, “I ran my fingernail across it and it didn’t snag” routine just doesn’t cut it anymore. So what’s changed with camshafts? The need for more horsepower, better fuel economy and lower emissions has led to the demand for improved cam designs. A great example of this can be seen in racing. NASCAR is very closely regulated to make sure every team is using the same engine. The basics of the engine haven’t changed in years, yet the horsepower being produced from these engines has increased from 650hp to as much as 900hp. Most of this boost can be attributed to more aggressive cam lob profiles but because they place added stress on valve train components, they also need to be replaced with more sophisticated parts. Diesel engine manufacturers are using the same principles to drive advancements. How does this affect your engine rebuild? Almost all newly manufactured engines feature camshafts with lobe designs that make it difficult for the average repair shop to measure wear and tear. In most instances the repair shop will only send the cam and cam followers to the machine shop for repair if they see visual signs of damage. The assumption should be made that any wear on the cam will also be found on followers, so they should also be sent out. Makes sense, right? Wrong. Many repair shops lack the training and tooling to handle new camshafts. The tooling required at a machine shop to measure, let alone repair these new camshafts is extremely expensive. It can easily cost over $100K for the measuring stand and a CNC machine capable of repairing a cam can go into the millions. For these reasons 90% of machine shops are unable to properly repair the latest camshafts. 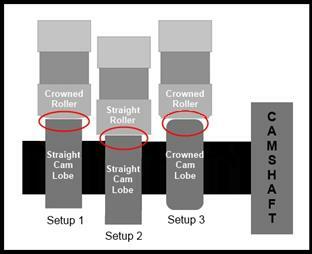 Check out the following diagram to illustrate why these new cams are so difficult to inspect and repair. *Please note that each of these setups would be unique to a camshaft and not found on the same camshaft. The image is for example only. Setup 1: A flat camshaft lobe and a tapered roller follower are used. The contact point in red is centered in the lobe, preventing wear from the weak edges of the cam. This is a good setup for the longevity of the part but it lacks the ability to make use of the cam for pinpoint control of valve timing. The cam in this setup is easy to repair because of the simple flat lobe profile. Setup 2: A flat camshaft lobe and a flat roller follower are used. Although this setup increases the surface area and decreases the overall pressure of the contact point in red, it also allows pressure to be placed on the weak edges of the cam, which can lead to a breakdown. Setup 3: A crowned camshaft lobe and crowned roller follower are used. This illustration shows a highly exaggerated crown on the lobe and follower. The crown is normally undetected by the naked eye. This is the style new engines are adopting. This setup keeps the contact point in red centered in both the cam and follower. This increases strength by keeping the load away from the weak lobe and follower sides. This setup also gives engineers greater control of the valve timing by adjusting the cam lobe profile. The problem with Setup 3 is that the crown of the lobe is not visible with the naked eye and as a result it can easily go unnoticed. Mechanics that are unaware of this can install a cam that has the crown worn beyond reuse guidelines. Machine shops that are used to dealing with flat cam lobe profiles can polish away the cam crown and not even know it. In addition, grinding and building back up without a CNC machine makes it nearly impossible to put the crown back into the cam lobe. All of these scenarios can lead to premature cam failure, decreased horsepower and lowered fuel economy. So should you change your camshaft or not? The number of variables involved makes this a hard decision. Do you want to go another million miles with this engine? How much would a qualified machine shop charge to inspect and possibly repair your cam? The best thing to do is weigh the cost of a replacement cam against keeping what you have. In the event that there is any visible wear, change the cam. Most of the wear isn’t even visible so if you can see it, it’s worse than you think. A worn cam can rob as much as 20 percent of your horsepower, not to mention significantly decreasing your engine’s fuel economy. Bottom line, replacing your camshaft (and cam followers) may pay you back faster than you might expect. If you have further questions regarding camshafts or any other diesel engine parts, please contact us 844-215-3406, email info@highwayandheavyparts.com or visit our website www.highwayandheavyparts.com. Our parts department would be happy to assist you. Highway and Heavy Parts specializes in rebuild kits, cylinder heads, camshafts, crankshafts, fuel injectors, turbochargers, and gasket sets for Caterpillar, Cummins, Detroit Diesel and International engines.